The Venice wandering around like modern fleuners! What is to see and do in the city? Don’t get overwhelmed!Among beautiful and important event like the Biennale d’arte di Venezia and The Festival del Cinema di venezia, the famous Carnival and 1000 concerts and attractions we can give a couple of useful advice for the tourist that has no time and little money! Are you visiting Venice? Well, just get lost! Wandering through the streets and alleys is gorgeous, ending up in this sort of sentimental and romantic journey through this enchanted town in often-empty squares and streets. or it happens just to follow a street that finishes in a canal! A dead end of striking beauty on the water! After this going around for “le calli” just ask directions or check the map to go to St. Mark’s Basilica, one of the most famous church in the country and in the world. onion domes and multi-colored marble pillars, and the interior is floor-to-ceiling mosaics. There are three smaller museums within the basilica which you’ll have to pay an entry to see; your budget and overall interest should dictate whether you visit all of them, but if you’re just going to pick one then by all means take the narrow and steep staircase in the entry alcove up to the museum that has the original horses which used to overlook the square – in addition to seeing the horses, you’ll also get to go out on the roof and overlook the square yourself. The piazza, Piazza San Marco (St. Mark’s Square) is of a gorgeous beauty outside and it is even better night time when nobody is around! oR just walk through on your way to th vaporetto or the train early morning. Venice isn’t a nightlife town, so you will have the chance to see it without the huge mass of people that usually swirled around on the day time. Or take a great view of St. Mark’s Square from the roof of St. Mark’s Basilic: it is easy to do, buying a ticket for the short elevator ride to the top of the Campanile. 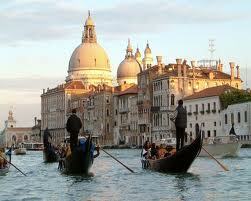 A lovely trip to do is the Grand Canal Tour in vaporetto, the Venice’s water-buses! and then Just go further and watch a Glass-Blowing Demonstration in Murano Island! Just walk around the streets of this island pretty close to Venice, pop over in an open studio and enjoy! Another “must-do” tour is the one that involves The Palazzo Ducale (Doge’s Palace): yes, it has an hefty admission fee but it includes the walk over the Ponte dei sospiri (Bridge of Sighs). Finally, go and buy food at The Rialto market, well-known as a fish market, with a plenty of fresh veggies and fruit for sale as well. This entry was posted on Monday, May 28th, 2012 at 11:34 am	and is filed under Events in Italy. You can follow any responses to this entry through the RSS 2.0 feed. You can leave a response, or trackback from your own site.